Being a technologist is all about solutions. OK, it’s about a lot more than that. It’s also about timing, effectiveness, innovation and using the right blend of technology to address the specific problem space. Your customers and your clients approach you for solutions. Their campaigns aren’t working, their systems have lost effectiveness or they simply need a new mobile app: they need a new technology solution. Can you help them? Here are four things they’re looking for. Here’s an organizational idea to address this. 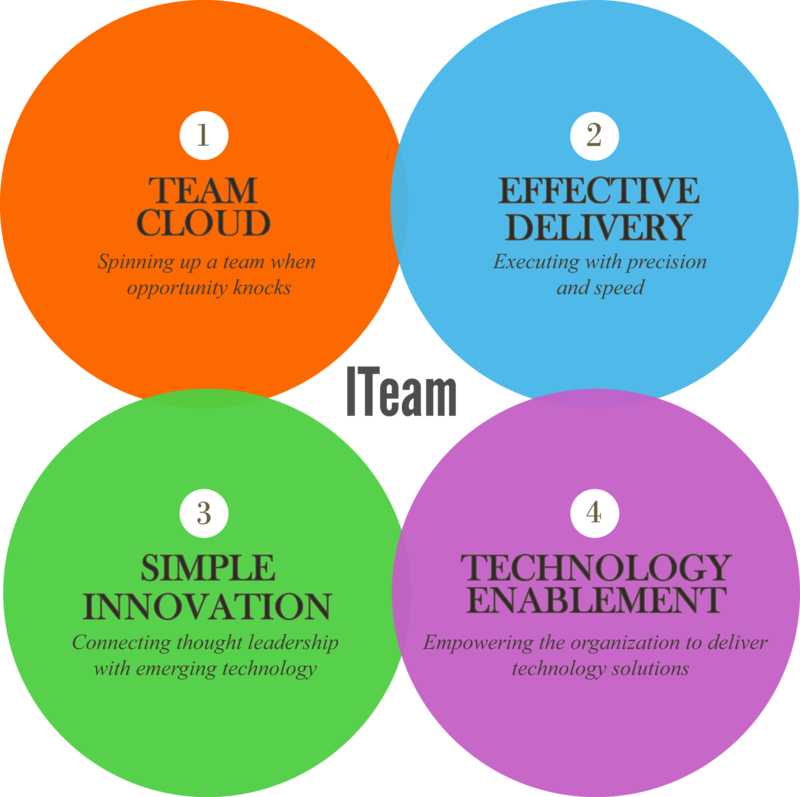 Create a Technology Innovations team (the ITeam) in your organization with the following core spheres of competence. Each sphere of competence addresses the following questions. Team Cloud: How do we create an organizational blueprint that allows us to spin up a team to handle a new client/customer/partner or technology quickly and effectively? When opportunity knocks and a new customer is eager and ready to go but timing is key, how do we spin up an organization that can effectively and quickly and credibly win and deliver on that business opportunity? What is the blueprint or playbook? Effective Delivery: How do we promote a simple delivery process that provides enough versatility and efficiency to “get in, do the job, get out” with quickness and precision? How do we brand and market the process and make it consumable and compelling? How do we get widespread adoption within our organization? Simple Innovation: How do we sponsor innovation that turns into money-making technology in a cost-effective way? How do we systematize the process? How do we investigate the technology landscape, identify enterprise problem spaces, integrate new technology with proven systems to connect ground-breaking solutions to clients or customers willing to pay for them? Technology Enablement: How do we mainstream successful emerging technology solution execution from the team to the organization? How do we brand, market, sponsor, motivate and infuse leveraging the integration of new technology development with existing technologies and clients or customers? Sometimes, being ready to deliver when the opportunity presents itself is the most important capability to have. To do so means putting the pieces in place before that time. This entry was posted in Innovation, Leadership, Opportunity, Software Development, Vision and tagged competing, Innovation, Leadership, Opportunity Knocks, The ITeam, Vision. Bookmark the permalink.